Kick off your visit on the 2nd (Tue): contemplate the waterfront views at Canal Grande, contemplate in the serene atmosphere at Basilica Santa Maria Gloriosa dei Frari, then wander the streets of Cannaregio, then take in the spiritual surroundings of Scrovegni Chapel, and finally pause for some serene contemplation at Basilica di Sant’Antonio. On the 3rd (Wed), you'll have a packed day of sightseeing: take in the views from Ponte di Rialto, admire the striking features of Doge's Palace, snap pictures at Ponte dei Sospiri, then admire the landmark architecture of Basilica di San Marco, and finally appreciate the extensive heritage of St. Mark's Square. To see maps, ratings, more things to do, and tourist information, read our Venice itinerary maker . Sao Paulo, Brazil to Venice is an approximately 17.5-hour flight. You can also do a combination of flight and train; or do a combination of bus and flight. You'll lose 4 hours traveling from Sao Paulo to Venice due to the time zone difference. Traveling from Sao Paulo in July, things will get a bit warmer in Venice: highs are around 36°C and lows about 22°C. Finish up your sightseeing early on the 3rd (Wed) so you can catch the train to Florence. Start off your visit on the 4th (Thu): get to know the fascinating history of Centro Storico, then admire the masterpieces at Uffizi Galleries, and then contemplate the long history of Loggia dei Lanzi. On the next day, take some stellar pictures from Piazzale Michelangelo, take in the spiritual surroundings of Basilica San Miniato al Monte, see the interesting displays at Galleria dell'Accademia, then take in the views from Ponte Vecchio, then admire the striking features of Basilica of Santa Maria Novella, and finally contemplate in the serene atmosphere at Cathedral of Santa Maria del Fiore. For maps, photos, ratings, and other tourist information, go to the Florence online driving holiday planner . Take a train from Venice to Florence in 2.5 hours. Alternatively, you can drive; or take a bus. In July in Florence, expect temperatures between 35°C during the day and 21°C at night. Finish your sightseeing early on the 5th (Fri) so you can travel to Portoferraio. Portoferraio is a town and comune in the province of Livorno, on the edge of the eponymous harbour of the island of Elba. Start off your visit on the 6th (Sat): enjoy the sand and surf at Spiaggia di Cavoli, then stroll through Spiaggia delle Tombe, and then kick back and relax at Spiaggia Canata. Get ready for a full day of sightseeing on the 7th (Sun): stop by Gelateria Zero Gradi, enjoy the sand and surf at Spiaggia Di Sansone, and then kick back and relax at Spiaggia di Capo Bianco. Traveling by combination of car and ferry from Florence to Portoferraio takes 3 hours. Alternatively, you can do a combination of train and ferry; or do a combination of bus, train, and ferry. In July, plan for daily highs up to 33°C, and evening lows to 24°C. Wrap up your sightseeing on the 7th (Sun) early enough to travel to Isola Del Giglio. Kick off your visit on the 8th (Mon): enjoy the sand and surf at Bagno Il Delfino and then enjoy the sand and surf at Cala dello Smeraldo. Get ready for a full day of sightseeing on the next day: enjoy the sand and surf at La Playa del Carma and then stroll through Bagno Amaranto. For where to stay, maps, more things to do, and other tourist information, refer to the Isola Del Giglio trip maker tool . Traveling by combination of ferry and car from Portoferraio to Isola Del Giglio takes 5 hours. Alternatively, you can do a combination of ferry, train, and bus. Expect somewhat warmer weather when traveling from Portoferraio in July: highs in Isola Del Giglio hover around 37°C, while lows dip to 22°C. 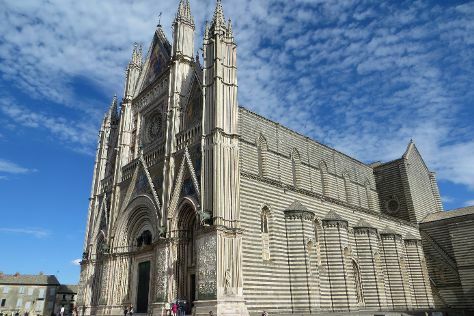 Finish up your sightseeing early on the 9th (Tue) so you can travel to Orvieto. Start off your visit on the 10th (Wed): look for gifts at Il Negozietto, steep yourself in history at Pozzo di San Patrizio, then do a tasting at Custodi Winery, then Head underground at Orvieto Sotterranea, and finally steep yourself in history at Duomo di Orvieto. To see more things to do, ratings, traveler tips, and tourist information, read Orvieto trip maker site . Do a combination of ferry and car from Isola Del Giglio to Orvieto in 3 hours. Alternatively, you can do a combination of ferry, bus, and train. In July, daily temperatures in Orvieto can reach 36°C, while at night they dip to 21°C. Wrap up your sightseeing on the 10th (Wed) early enough to travel to Ponza Island. A fairytale destination dotted with brightly painted traditional houses, Ponza Island remains one of Italy's least-spoiled gems, miraculously managing to avoid the ravages of mass tourism. On the 11th (Thu), enjoy the sand and surf at Cala Gaetano, kick back and relax at Cala Felci, and then enjoy the sand and surf at Punta Di Capo Bianco. To see more things to do, ratings, and tourist information, read our Ponza Island tour builder website . Do a combination of car and ferry from Orvieto to Ponza Island in 3.5 hours. Alternatively, you can do a combination of train, taxi, and ferry; or do a combination of train, bus, and ferry. When traveling from Orvieto in July, plan for slightly colder days and somewhat warmer nights in Ponza Island: temperatures range from 32°C by day to 26°C at night. Cap off your sightseeing on the 11th (Thu) early enough to travel to Rome. Start off your visit on the 12th (Fri): explore the ancient world of Colosseum, get to know the fascinating history of Piazza Navona, then don't miss a visit to St. Peter's Basilica, then admire the landmark architecture of Pantheon, and finally don't miss a visit to Trevi Fountain. To see other places to visit, maps, where to stay, and more tourist information, use the Rome visit planner. You can do a combination of ferry and car from Ponza Island to Rome in 2.5 hours. Alternatively, you can do a combination of ferry, taxi, and train; or do a combination of ferry and train. Expect a bit warmer weather when traveling from Ponza Island in July: highs in Rome hover around 37°C, while lows dip to 24°C. Wrap up your sightseeing by early afternoon on the 13th (Sat) to allow time for travel back home.